The tone for dystopian nightmare We Happy Few is set very early on. Sat in an office, mindlessly censoring or approving snippets of information sent to you in cannisters, you are reminded it's time to take your Joy pill. So far, so depressing and so familiar to many office drones, trapped in a daily 9 to 5. But refusing to take your pill and biffing them into a cannister, the world seems to clarify around you. However, what transpires next as you're invited to a pinata party is truly nightmarish as a group circles around a table, chanting at you to hit the pinata with masks of warped joy on their faces. It's like something out of the League of Gentlemen - and it concludes in truly warped fashion as it's revealed the pinata is actually a rat and people are scrabbling to eat it. 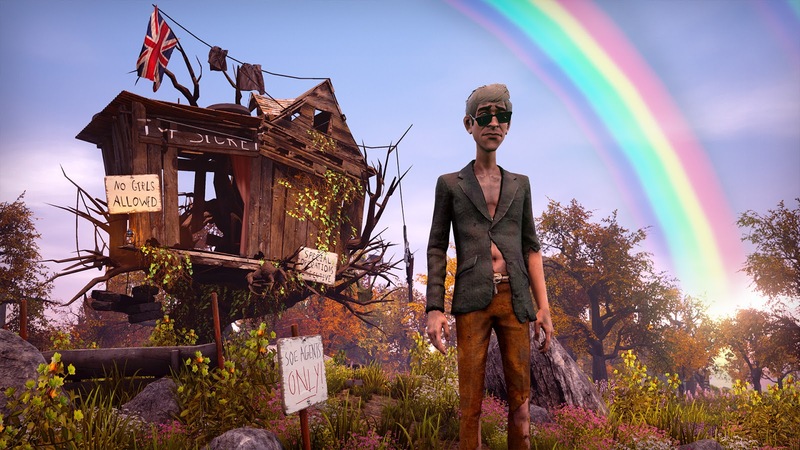 Though in many ways, this garish start is perfect for We Happy Few; it's a bolt upright reveal that boldly sets the tone for Compulsion Games' trip to an alternative 1960s England. And it's pretty warped as the game plays out. Once you've recovered from the shock reveal, the game drops you into a bunker underground and you have to head out and basically survive. From dealing with thirst to injuries that prove to be mortal if untended, We Happy Few's emphasis may well be on survival but it's also an exploration game with some combat thrown in for equal measure as well. Wandering around gets you into the company of others, and lets you explore the world of Wellington Wells, that would appear to be the antithesis of a Disney-esque version of a British surrounding. And as you struggle to survive more, the idea becomes that you have to get by without anyone suspecting that you're off your meds and a danger. 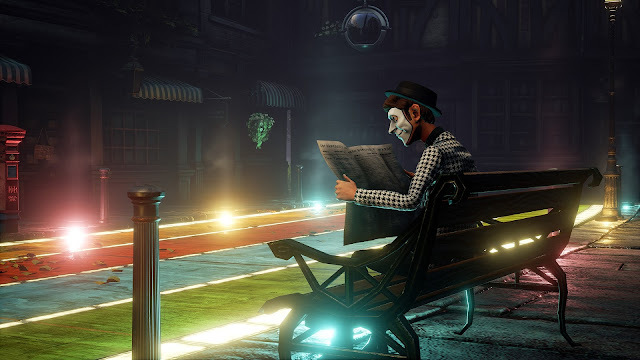 The alpha stage of We Happy Few is certainly a stylish blast of an alternative world that really wouldn't be out of place in the annals of the likes of Brit sci-fi anthology 2000AD. Its blackness and crueller edges are what set it above the rest of its ilk, but it really does need a little more story to keep you hooked. Exploring is fruitful but the idea of where to go and what to do is somewhat lacking. While that direction is perhaps laudable, it soon means the stylish elements are what remain in your mind, rather than story-led rug pulls. Graphically, the game is excellent, with the sense of unease crawling off the screen and under your skin without any kind of warning. It's creepy and unsettling and that really marks out in this world where everything is similar or an ever-so slightly unusual version of similar. Ultimately Compulsion Games' alpha shows the reasons that We Happy Few really stood out at E3 - it's a demonstration of something unique and hopefully something a little more original. 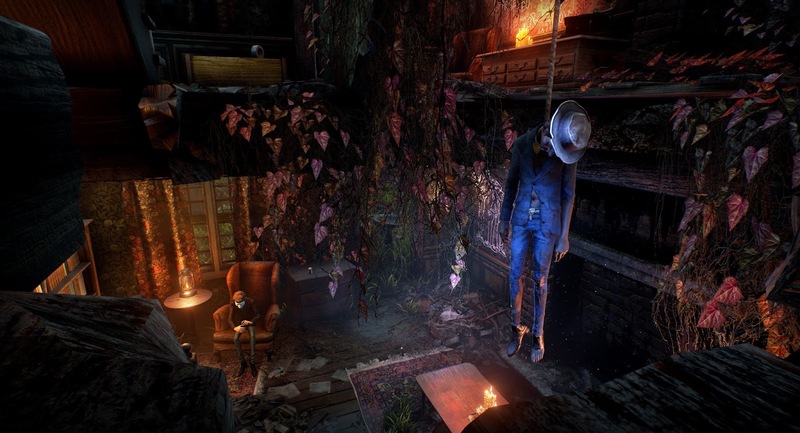 It scores highly for a truly out of the box opening that really does offer some visual shocks and set the tone for what lies ahead - darkly delicious and potentially devious, with some more indication of what's expected, it looks like We Happy Few could be a force to be reckoned with.